Now that Hime knows Mitsuki’s true identity, the pair have been unable to work together at all. This means that their whole schwestern (a.k.a sisters) act is slowly falling apart, causing rumours and whispers in their café. Can they repair their relationship and learn to work together again? Or will they be forced to break off their act and risk the café’s reputation? The first act (or shift as they’re called in this series) of the volume takes us back to where our heroines first met and their blossoming friendship, leading up to when it all fell apart. Whilst the inevitable break-up itself relies heavily on a tired ‘misunderstanding’ trope that may or may not bother some readers, there’s no denying that the build-up of their friendship is handled very nicely. You can see how the pair gravitated towards each other and why they worked well together, personality-wise. The act itself is also incredibly sweet and cute; Mitsuki (real name Yano) as a younger student is adorable, despite her sterner exterior. The other student’s dislike for the poor girl, who tries to hide her pain, is also illustrated well as she tries her best in anything she puts her mind to, and seeing Hime helping her come out of her shell a bit more really sow the seeds of a lovely connection. The following acts return to what’s happening in the present day, with Hime and Yano now avoiding each other and risking their jobs as a result. Despite Hime’s natural instinct to put on her cuteness face and make everyone like her, this new revelation has completely thrown her off and she has no idea as to how to solve it. It’s a mind game, again based upon a simple misunderstanding that logically could have been solved quickly in real life (but then we wouldn’t have a romantic comedy, would we?) Nevertheless, you can understand both points of view: Yano was Hime’s first ‘real’ friend who ended up, in her mind, betraying her, despite telling her why she does the things she does. However, from Yano’s standpoint, Hime is her close friend and constantly feels the need to keep up her façade of sweetness and cuteness rather than do what she’s really passionate about, whereas Yano, who’s hard-working and serious, struggles to see why Hime acts the way she does. This sort of conflict, and the arguing and tensions that comes from it, could have been a nugget for some yuri writers to drag out the entire series, however Miman doesn’t do that at all. Instead, the pair finally come together towards the end of the book and manage to actually express their feelings, leading to a mutual and heartfelt conclusion. This writing is much appreciated as too many rom-coms, or series with romance in them, tend to take it to breaking point, just so the reunion/resolution is served as the climax, but here the rebuilding of friendship is necessary – not only for the job but to really feel connected to these two as a couple and help them evolve as characters, both together and separately. It’s more interesting to see how they progress from here and where the story will take them now that their past conflict is resolved, rather than using it as a cheap trick to run the ‘will they, won’t they?’ trope into the ground. In the last act there’s not much plot progression aside from hinting at the next arc, which seems to be focusing on Hime’s friend Kanoko, who’s been playing the ‘third wheel’ character so far in the story. There have been many hints that there’s more to her than that, as well as potentially something more troubling, so the next volume should be quite interesting to see how it develops, considering how well the story is going so far. Art continues to be a highlight of the book with lots of lovingly detailed panels of the main pair that are very expressive and intimate. The colour pages at the top only serve to highlight this so I hope we can get a few more in the next book. This volume also contains a side story that takes place when Hime and Yano were kids, plus a mini-afterword where the author interestingly discusses her original plans for the series to try and make it all one volume – lucky for us she didn’t stick to that plan! 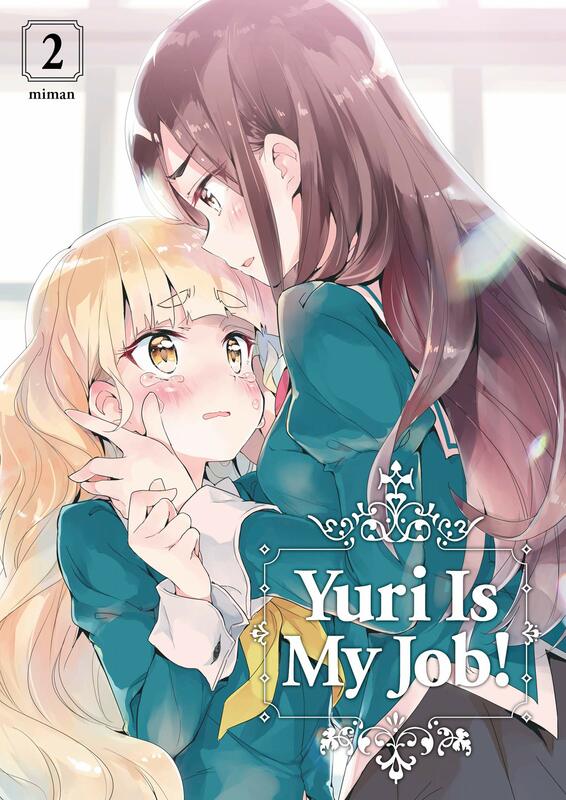 Volume 2 of Yuri Is My Job! continues the story strongly by allowing events and relationships to progress naturally rather than trying to stretch the clichés to ridiculous extremes. The relationships are written well, with lovely art and the story is perfectly paced. Keep it up, Miman!